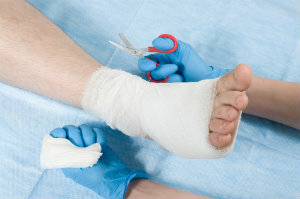 What Foot Problems Require Surgery? Many foot problems can be repaired and treated without surgery; however, some condition will require surgery. Find out what foot problems require surgery. This is the good news: surgery can make a real difference in relieving your discomfort. However, it still needs to be considered carefully. All procedures come with risks of complications. You need to know what to expect before you decide to go ahead. Unless you have a serious injury that can’t be resolved conservatively, an invasive solution shouldn’t be your first option. Dr. Evan Merrill and Dr. Adam Gerber understand that the majority of conditions that affect the foot and ankle can be significantly improved, or even resolved, using noninvasive measures. Shoe changes, orthotics, medications, physical therapy, and even some external procedures have been used very successfully to treat a wide variety of foot and ankle conditions. Only if the pain persists after the conservative options have been exhausted do you consider surgical procedures. Medicine is not an exact or formulaic science; success depends on the physician making the most informed and accurate choices for treatment. Dr. Evan Merrill and Dr. Adam Gerber will need an in-depth look at your foot, so they will most likely request diagnostic images. They use them to identify what needs to be corrected and how to best approach it. After that, you will be presented with your options: which procedures are available to you, how they are performed, what the risks may be, and which is most likely to succeed. Together you make the choice of what will be best for your body and your unique needs. In some cases, we may recommend Multiwave Locked System (MLS) Laser Therapy as a post-operative treatment. Using finely tuned wavelengths of light energy, MLS Laser Therapy can stimulate the body's natural healing processes for soft tissue injuries, accelerating the rate of recovery and providing relief from pain and inflammation. We will be sure to fully discuss MLS Laser Therapy with you if it is an option worth considering for your individual needs. Standard treatments are short (usually about 10 minutes), and a series of sessions would be scheduled. The benefits of treatment are usually felt after the first session, but stack with cumulative treatments. You don’t have to be afraid of procedures to correct a problem. If conservative treatments have been ineffective, or would not be helpful, a surgical solution may offer you a real chance to eliminate your pain and restore your feet to health. Dr. Evan Merrill and Dr. Adam Gerber are well-trained and experienced in performing a variety of foot and ankle procedures. Don’t ignore chronic discomfort because you are nervous about surgery. Instead, contact Southern Oregon Foot & Ankle in Medford for an appointment or for more information. Call (541) 776-3338 or visit our contact page online to reach us.